Finance at the Fortune Institute of International Business, Vasant Vihar, New Delhi, 110057, India. Finance at the Department of Management Studies, Indian Institute of Technology, Hauz Khas, New Delhi, 110016, India. Research aims: This study examines firms’ adherence to the pecking order in deficit and surplus situations by comparing firms in India and China. It also examines the extent of debt issues and redemption when the deficits and surpluses are relatively large in amount. Design/Methodology/Approach: This study analyses the data of the Bombay Stock Exchange (BSE) 500 index and the Shanghai Stock Exchange (SSE) 380 index firms. It uses Ordinary Least Square (OLS) regression to examine the effect of deficit and surplus on debt issuance and redemption. 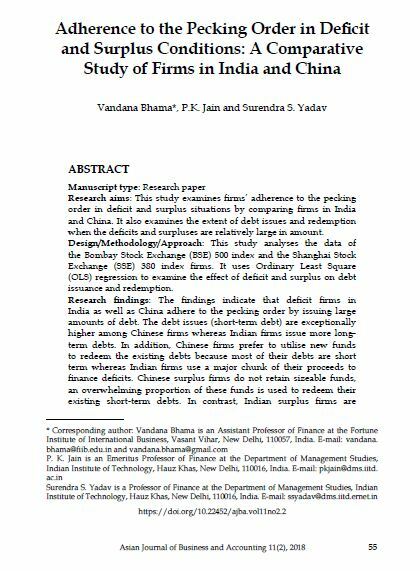 Research findings: The findings indicate that deficit firms in India as well as China adhere to the pecking order by issuing large amounts of debt. The debt issues (short-term debt) are exceptionally higher among Chinese firms whereas Indian firms issue more longterm debts. In addition, Chinese firms prefer to utilise new funds to redeem the existing debts because most of their debts are short term whereas Indian firms use a major chunk of their proceeds to finance deficits. Chinese surplus firms do not retain sizeable funds, an overwhelming proportion of these funds is used to redeem their existing short-term debts. In contrast, Indian surplus firms are reluctant to retire debts at a fast pace because of the existing low debt to equity ratios. Indian firms also have more long-term debts in their capital structure. Theoretical contribution/Originality: This study extends on previous works on the pecking order theory in developing countries by splitting the analysis into two: deficit firms and surplus firms. Practitioner/Policy implications: This study provides insights into the financing practices of the two developing economies. It also highlights the differences in corporate financing of these two countries. Research limitations/Implications: This study is confined to only Indian and Chinese firms. It mainly focusses on dataset that have been accumulated over a period of 12 years only. Future studies may consider adding the financing cost aspect so as to generate a more impressive analysis of firms’ adherence to the pecking order theory.